Hunting is an art and with predators such as coyotes, the canvas just gets rougher. Generally speaking, coyotes are cunning, clever animals that can pose a great danger if not well hunted down. You need the perfect combination of timing and skill; or better yet, a proper coyote call. Sure, a comprehensive predator call may just do the trick, but the best results will come from a quality coyote call such as the popular Primos Alpha Dogg Electronic Predator Call. If you are a hunter in the market for a quality predator call, here’s why you want to consider the Primos. Worth noting is this product was crafted as a result of years of predator hunting research by gaming aficionado Randy Anderson – a popular name among hunting aficionados. In a nutshell, it is a high quality and popular product designed to get the most out of your hunting expeditions thanks to the features below. Any predator call worth its salt should not only be compact, but also hard for the cunning predators to spot. The Primos Alpha Dogg strikes the perfect combination of both thanks to its innovative portable design and camouflaging exterior. Generally speaking, coyotes can easily spot artificial products from miles away, meaning your safest bet of ending up with a game lies in the Realtree Max-1 camouflage casing that comes with the Primos Alpha Dogg Electronic Predator Call. Both the remote and speakers are powered by a trio of AA batteries, which work well at delivering high quality, distortion-free sound. While having a variety of options is always advisable in most scenarios, hunting down predators is quite different. This predator calls comes with more than 75 pre-installed nature calls, meaning finding the best one to use can gobble up quality time you surely don’t have. The Alpha Primos Dogg, however, boasts a lean sequence of six preset hunting sequences to make your job easier. Sure, you are allowed to add more hunting sequences if you so wish, but most experts concur that the lean sequence that defines the Alpha Dogg has everything you need. As earlier stated, hunting down coyotes is an art. You need to be well armed with quality distortion-free speakers, besides having luck on your side. 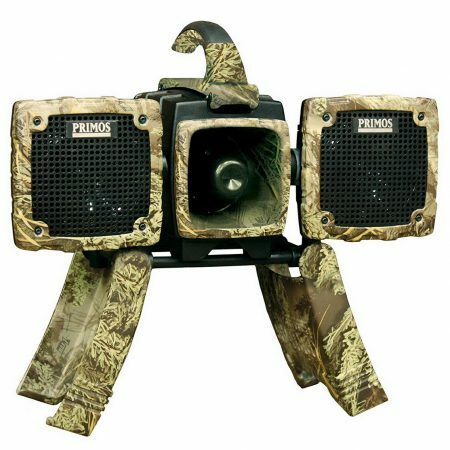 This predator call packs premium 20-watt rotational cone speakers crafted to deliver crystal clear sounds for miles. Alpha Dogg also decided to throw in a powerful 25-watt horn speaker placed perfectly in between the cones. The horn speaker is capable of making long calls to coyotes hiding miles away, meaning you don’t have to keep moving just to end up with a game. Also worth writing home about are the innovatively elevated legs, universal tripod mounting threads and a rugged speaker case for durability. Having options usually doesn’t hurt and with the Primos Alpha Dogg Electronic Predator Call, you get 64 digitally installed nature calls besides six hunting sequences to lure out coyotes. That’s not all, though. It also allows you to add or delete the sounds which are stored on a generous 2 GB memory stick. In a nutshell, the thoughtful USB port allows you to download more than 1000 nature calls from Primos hunting platform or othe apps. Moreover, you get an audio port to add an extra speaker if you so wish and play MP3 sounds from external devices. The user-friendly remote control that comes with the Primos Alpha Dogg Predator Call is capable of operating at a sufficient distance of 200 yards from the speakers. On the remote, you’ll find the Primos exclusive HOT button intended at changing the sounds depending on the surroundings. As if that’s not enough, Primos also decided to throw in a large 2.5 inch color LCD screen that lets you easily scroll between the generous amounts of nature calls categorized by species to make your work easier. In a nutshell, the remote allows you to operate decoys, adjust volume levels and make necessary changes in terms of sound clarity. User-friendly remote control and LCD display for adjustments and settings. 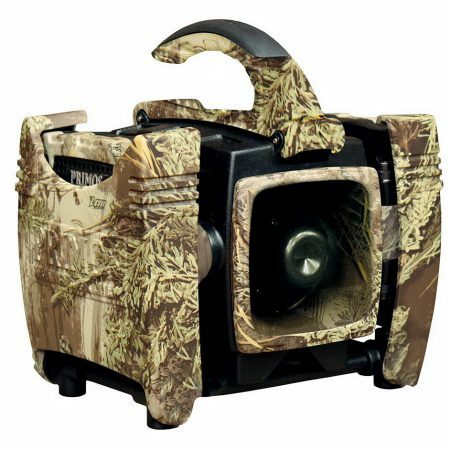 Compact design with camouflage casing to get the most out of your coyote hunting experience. Distortion-free, premium speakers designed to deliver dynamic and authentic nature calls. Uses batteries meaning it can be used in just about any terrain. Preset hunting sequences and nature calls intended at easing your experience. Extra output and input options that allow you to delete or add calls. The batteries drain out quickly especially when used at high volume levels. A little costly compared to other predator calls of its caliber. User-friendly, ergonomic remote control with 2.5-inch display and simplistic control layout. Durable casing designed for the toughest terrains and scenarios. Rotating speaker system intended at delivering crisp, realistic and dynamic sounds. Quality 180-degree speaker calling coverage. Capable of delivering distortion-free sounds even in high volume. 64 digitally mastered nature calls and six pre-set sequences. Also allows you to add or delete sounds if you so wish. Tripod mounting threads and perfectly elevated legs. Q. Is the Primos Alpha Dogg Electronic Predator Call all-weather? A. Sure, the unit will perfectly work in all weather conditions regardless of whether it’s raining, snowing or drizzling. It comes with a water-proof, durable casing that allows it to work in all terrains and scenarios. Q. How long can the batteries last? A. Depending on how often you use it and at which volume levels, the batteries can last up to three to four weeks on average. Q. Can you connect the Primos Alpha Dogg’s speakers to external devices? A. Yes, the electronic predator call actually boasts an audio port that allows you to play MP3 sounds from portable devices. The audio port also enables the user to attach an additional speaker where deemed necessary.Treatment isn’t necessary at first since these boots come ready to go. However, it may come in handy after a while to prevent rain or sun damage. Q. How is it controlled and adjusted? A. The Primos Alpha Dogg Electronic Predator Call comes with a user-friendly, ergonomic remote control that can operate up to 200 yards from the unit. In addition to this, you also get an LCD display to easily scroll through the nature calls. If you are in the market for a high quality predator call to hunt down coyotes, the Primos Alpha Dogg Electronic Predator Call is certainly worth investment and it’s not that hard to see why. For starters, it comes in a compact design complete with a camouflaging exterior intended at making it undetectable regardless of terrain. The casing is well-built to military-grade standards, meaning it will likely serve you a lifetime if properly maintained. Secondly, it is built for the average Joe – it doesn’t matter whether you are a pro hunter or amateur. It sports user-friendly adjustment settings, controls and display that make it easy to operate. In a nutshell, few predator calls can lure out coyotes the way this one can. 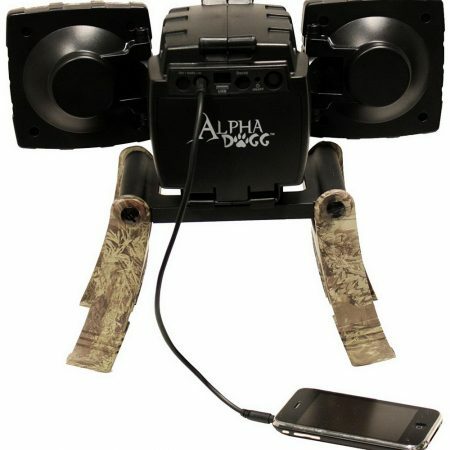 The Primos Alpha Dogg’s speakers deliver on high-quality, distortion-free sounds for miles. Most hunting aficionados have sworn by the Alpha Dogg and for valid reason. It not only provides great value for money, but also offers everything you’d want in a high quality predator call. Check out the list of Best Coyote Calls and The Ultimate Coyote Calling Tips!